MOLLUSCA : NUDIBRANCHIA : Janolidae SNAILS, SLUGS, ETC. 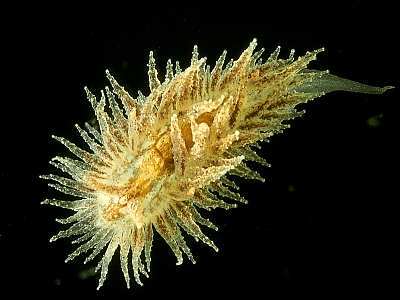 Description: A well camouflaged, brown-coloured nudibranch. The cerata are numerous, with rough, spiny surfaces and tapering to points, and extend across the front of the body. They fall off with the minimum of disturbance, and may poison other nudibranchs in a collecting dish. The rhinophores are brown, with spiral grooves and a crest structure as in the previous species. The digestive gland in the cerata is dark brown, and does not extend to the tip. Grows up to 30mm in length. Habitat: Found amongst the erect bryozoans Scrupocellaria spp. which appear to be the food. It has been found on buoy ropes and man-made habitats in sheltered conditions and also on exposed rockfaces. The spawn is a wavy spiral thread, coiled round the food and with a beaded appearance. Distribution: Recent records from St. Kilda and the Summer Isles, Lough Hyne and Lundy Island. A rarely recorded species, also reported from France, Spain and the Mediterranean. Similar Species: The rare Proctonotus mucroniferus is similar in appearance, but lacks the crest between the rhinophores. Pointed cerata with rough surfaces, extending across front of body. Picton, B.E. & Morrow, C.C. (2016). Janolus hyalinus (Alder & Hancock, 1854). [In] Encyclopedia of Marine Life of Britain and Ireland.